Lot Detail - An Important Captivity Narrative, in the Pennsylvania Wilds During the Revolutionary War. An Important Captivity Narrative, in the Pennsylvania Wilds During the Revolutionary War. 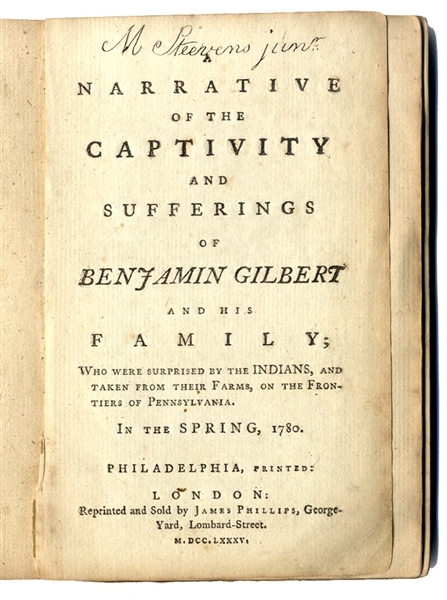 Book, “NARRATIVE OF THE CAPTIVITY AND SUFFERINGS OF BENJAMIN GILBERT AND HIS FAMILY; WHO WERE SURPRISED BY THE INDIANS, AND TAKEN FROM THEIR FARMS, ON THE FRONTIERS OF PENNSYLVANIA In the Spring, 1780”, Philadelphia, printed: London: reprinted and Sold by James Phillips, 1785., 124pp., worn separate card stock covers, interior pages fine. The first British edition of this rare captivity narrative, after the first edition printed in Philadelphia the previous year. Gilbert dictated his experiences to William Walton, who wrote this book. On June 25, 1780 a party of eleven Seneca Indians led by Rowland and John Montour (sons of the famous Catharine Montour) invaded frontier Pennsylvania settlements where the Gilbert homestead was located. The fifteen captives were bound with cords, their home was plundered and burned before their eyes, and they were taken to Fort Niagara, where they were divided among the Indians. Individual family members were redeemed by degrees mostly at Fort Niagara, being sent first to Montreal and then home to Pennsylvania. "Extremely valuable for its account of Indian life" - Vail. The verso of the last leaf lists other texts sold by Phillips, including one by William Penn.